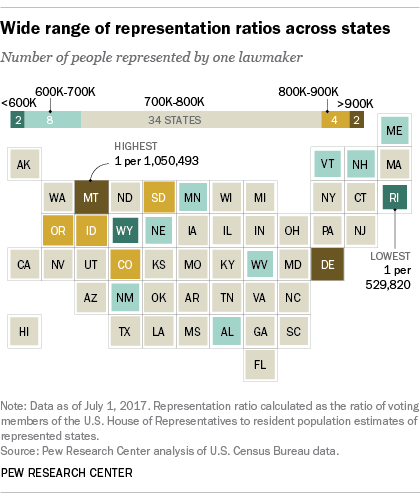 The U.S. findings in this post are based on Pew Research Center analyses of House membership changes since 1789 and historical population data (actual when available, estimated when not). They exclude territories, the District of Columbia and other U.S. possessions that don’t have voting representation in the House. The analysis was complicated somewhat by the fact that new states often were admitted after a decennial census but before the apportionment law based on that census took effect (usually about three years afterward). In such cases, the new states were analyzed as if they had been states at the time of the census. 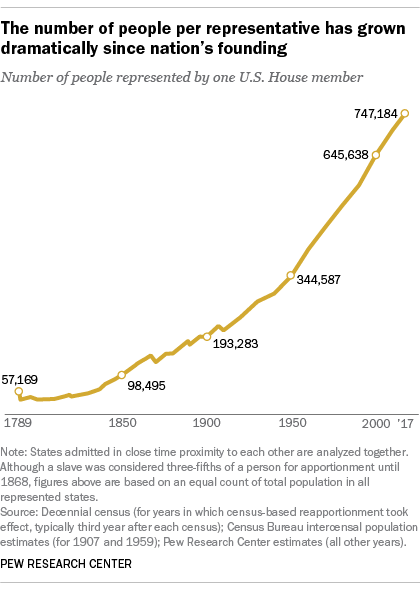 For more than a century thereafter, as the U.S. population grew and new states were admitted, the House’s membership grew too (except for two short-lived contractions in the mid-1800s). The expansion generally was managed in such a way that, even as the representation ratio steadily rose, states seldom lost seats from one apportionment to the next. That process ran aground in the 1920s. The 1920 census revealed a “major and continuing shift” of the U.S. population from rural to urban areas; when the time came to reapportion the House, as a Census Bureau summary puts it, rural representatives “worked to derail the process, fearful of losing political power to the cities.” In fact, the House wasn’t reapportioned until after the 1930 census; the 1929 law authorizing that census also capped the size of the House at 435. And there it has remained, except for a brief period from 1959 to 1963 when the chamber temporarily added two members to represent the newly admitted states of Alaska and Hawaii. We took the most recent population estimate for each OECD nation and divided it by the current number of seats in the lower chamber of each national legislature (or, in the case of unicameral bodies, the single chamber). After the U.S., the two countries with the highest representation ratios are Japan (one lawmaker for every 272,108 Japanese) and Mexico (one for every 247,965 Mexicans). Iceland had the lowest ratio: one member of the Althing for every 5,500 or so Icelanders. 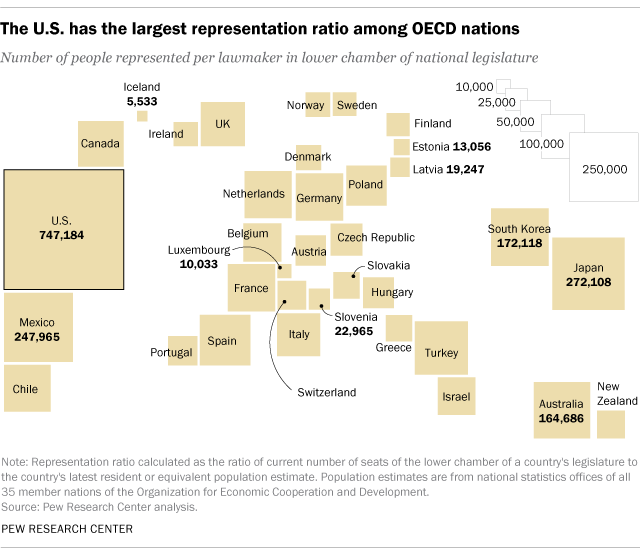 While much of the cross-national disparity in representation ratios can be explained by the big population of the U.S. (with more than 325 million people it’s the largest country in the OECD), that’s not the only reason. Eight OECD countries have larger lower chambers than the U.S. House, with Germany’s Bundestag topping the league table with 709 members. The British House of Commons has 650 MPs (Members of Parliament); Italy’s Chamber of Deputies has 630 lawmakers.